Dr. Bradley Portenoy earned his Doctorate of Dental Surgery with Thesis Honors in Behavioral Science from SUNY at Buffalo School of Dental Medicine in 1985. A Thesis Honors is a Master’s equivalent awarded to a student who completes, defends, and publishes research in a chosen field. Dr. Portenoy, a psychology major with honors at SUNY at Albany, saw a need to study more psychology in the field of dentistry and conducted this research while also studying full time as a dental student. Following graduation, Dr. Portenoy attended a two-year residency program where he was among some of the first doctors to receive Branemark restorative implant training. The program highly emphasized prosthodontics and was the beginning point for Dr. Portenoy’s passion for comprehensive restorative care. During his residency, he was selected to be Chief Resident overseeing fellow residents at a large hospital dental facility. 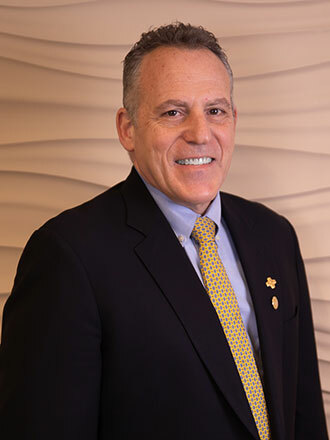 Following residency, Dr. Portenoy settled in Rockville Centre where he has devoted his career to providing exceptional comprehensive restorative dentistry. To this end, he returned to Columbia University to receive implant surgical training. In 2012, he attained the title of Fellow of the International Congress of Oral 1m implantologists. He is one of the first Dentists in the United States to achieve Scholar status from the L.D. Pankey Institute for Advanced Dental Education, the Institute's highest honor. He has been a visiting faculty member of the L.D. Pankey Institute for Advanced Dental Education since 2002 and has lectured to hundreds of dentists who come to The Pankey Institute from around the world. In 2011, he was honored with an appointment to the L.D. Pankey Foundations Board of Directors where he served as Vice Chair. Dr. Portenoy has also had the opportunity to lecture on a national basis having given dozens of lectures to dentists at some of the most prestigious dental meetings and dental schools in the country. He now consults for dentists who wish to attain a high quality comprehensive care practices. Dr. Portenoy also has published articles in several national publications. Dr. Portenoy was raised in upstate Rockland County, but followed his wife to Long Island. He and his wife, Cathy, have lived in Rockville Centre for over 30 years. The Portenoys raised their three children in RVC, and are currently empty nesters! Aside from his passion for dentistry, Dr. Portenoy has been a guitar player since the age of 7. He played professionally throughout his early adulthood, and was part of the backup bands for many oldies acts such as the Regents, The Platters and Ben E. King. In fact, Dr. Portenoy worked his way through college by gigging Thursdays-Saturdays, all while attending full-time college. Dental school was just too rigorous to continue playing out, so Dr. P finally retired from the music scene. Today, Dr. Portenoy enjoys collecting beautiful and interesting guitars and playing for friends and family. He is also an avid collector of fountain pens. Dr. Portenoy also boasts being a horrible golfer and a mediocre skier. When not embarrassing himself on the links or slopes, Dr. Portenoy can be seen at the gym pumping what little iron he can still lift! The Portenoys are honored and blessed to have been able to live in such a wonderful and vital community as Rockville Centre!